Donkeylicious: Did All The Female Republicans Defect In The War On Women? Did All The Female Republicans Defect In The War On Women? 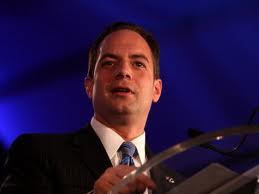 That's the best explanation I can think of for why Reince Preibus put himself out front to deny the existence of a GOP war on women (claiming that it was as unreal as a GOP war on caterpillars). This is the kind of issue where you get some female Republican operative to do your talking for you. Your top male figurehead is not the person who should be doing this. The fact that he expressed himself in a way where an insect species was mentioned as a parallel to "women" didn't help. I get the point he's trying to make, that these things are equally unreal, but it would've been more apt to choose something nicer-sounding, or an actual human demographic group like redheads or electricians or Anabaptists. Well, nobody has any idea who the Anabaptists were anymore, but the other two would've been better. The substantive problem, of course, is that having a talking head come out and say "it's not happening" isn't going to help very much when Republican state legislators all over the country are restricting access to abortion and Rush Limbaugh attacked Sandra Fluke for supporting contraception. Speaking of the War on Women and its political fallout, much has been made of the fact that in the 12 Gallup swing states, Obama's beating Romney by something on the order of 61-30 among women under 50. And understandably so; if this trend were to hold, it wouldn't just be a big f'in deal; it would be a political earthquake. Among men under 50 in the swing states, Obama's beating Romney by ~15 points, roughly 55-40. Given the GOP's longstanding advantage among men overall, for them to be losing men under 50 by such a margin in the states where it matters is an earthquake, all right. The question for the Dems is: how do we solidify this edge? How do we make sure we lock in the support of both women and men under 50 before it slips away? Because if the Dems can maintain big advantages with both sexes among people under 50, the GOP's days are truly numbered. Now, how do I know this fact that's eluded everyone else in the political world? Easy: they've said that, among registered voters in the swing states, Romney has a +1 advantage (48-47) among men overall, and a +18 (56-38) advantage among men over 50. (+1)(100) = (+18)(48.7) + (X)(51.3). Solve for X to get the size of Romney's deficit among men under 50. As usual, thanks for posting this, cyclist. Some of this may reflect the new Ryan / GOP Medicare strategy -- cuts for the young folk that don't hit the currently elderly. Neil - happy to share. Given that this poll has been out for a week, it's been driving me nuts that I'm the only one who seems to have noticed this result. As far as the why of it, I wonder if some of it isn't just the last 40+ years of cultural change making a difference: back when I was younger, men and women were more likely to live in separate worlds in lots of ways, and so stuff that was be important to a lot of women might have barely registered with many men. That's a lot less true than it used to be, and while all the ultrasound/birth control/attack on Planned Parenthood and family planning stuff obviously still hits closer to home with women, I suspect that a lot of younger men are picking up on this and taking it personally as well. And that's building on top of things like the GOP's continued opposition to equal rights for gays, which may play well with the older folks, but most younger adults know and accept openly gay people, and if they needed another good reason not to vote Republican, they've now got another really big one. This is nothing more than my personal hunch, so take it with a shaker or three of salt.